Did you see how we carved a rose out of a tomato? 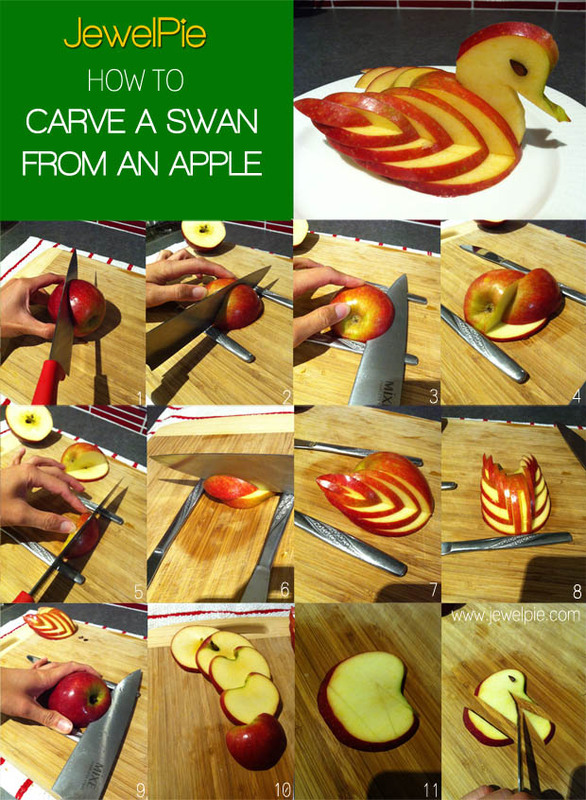 If you’ve tried it and you’re looking for something more challenging, try to making a swan out of an apple! It takes about 5 to 10 minutes to complete. Place the half with the bottom of the core in between two knives.Slice the apple to the right of the core. The knives will stop you from slicing all the way through. Slice the apple horizontally, using the knives as a guide and slice only until where it meets the cut in step 2. Using only the wedge, repeat step 3. Repeating the above steps will give you the sculpture’s wing. Repeat on the left side of the apple for the other wing. 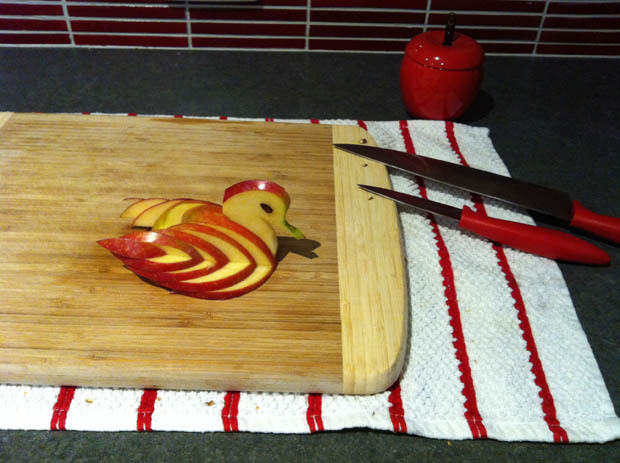 To make the slot for the swan’s head, slice a little bit of the apple in the middle. Place the another half of the uncarved apple between the two knives and slice it horizontally. Use the apple seeds as the eyes of the swan, press it in using the flat edge of your knife. Trim the neck as necessary. 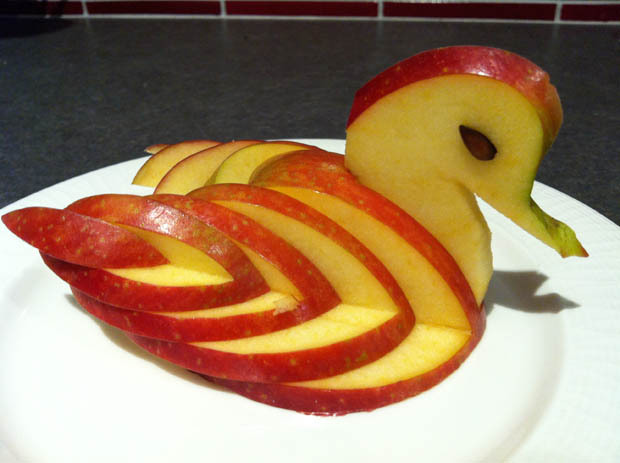 Now you’ve made a swan out of an apple! To prevent the swan to turn brown from oxidation, spray or glaze the apple with lemon juice. Have you carved any fruit or vegetable? Let us know! Sue Tay is a Chartered Accountant who works full time in Melbourne, Australia. 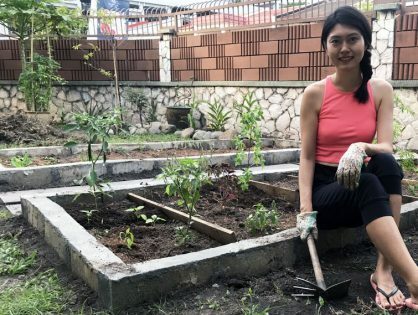 In the evenings and at weekends, she loves cooking healthy meals for herself, her boyfriend, relatives, friends and colleagues. 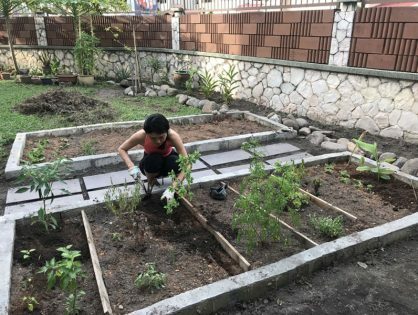 She frequently hosts lunch and dinner parties. Sue Tay also enjoys aerial silks and lyra, two forms of circus arts for fitness.